I did a search, and didn't see a post about this topic. So, I started turning my first acrylic pens. They make beautiful pens, but they are a PITA to work with. I've got nasty chip outs on 3 of the 6 pens i've turned so far. One is a just a tiny chip (well, I could fix it to just a small chip) that is barely noticeable (but of course, its all I notice). The other two have chips that either go to the tube, or go beneath the depth for the fit with the pen kit. A friend suggested I get some clear epoxy and fill the chips then shape/sand. Are there other tips to repairing chips in acrylic pens? While I'm posting, is there a better way to glue the tubes in acrylics? Being that they are often semi-transparent, they glue I use for the tubes is visible, and IMO, ruins the smooth look of the pen, especially if I don't get enough glue in the tube. My daughter thinks it looks awesome, I don't. I'm using thick CA glue to glue the tubes, does epoxy provide a cleaner look for the glued tube? I use superglue to fill small chips or bubbles in acrylics, it is invisible after the repair. Also for Simi transparent acrylics, I paint the inside of the blank before gluing in the tube, try different colors of paint for totally different looks of the finished blank. There are many different types of plastic blanks. Some turn easily (Alumilite) and some are very challenging (Inlace Acrylester) and the rest IMHO are in-between. There is a learning curve for each type of blank. In general, fast speed (I always run at the max), a light touch, and a sharp tool are the basic requirements. I've filled small pits with medium CA--sometimes it works, sometimes not. If it's to the tube, I'd turn off the remaining blank and re-use the tube. I always glue-up with epoxy. Unless you are POSITIVE the tube won't show through, ALWAYS paint the inside of the hole. That prevents both the brass tube and the glue lines from showing. My only other advice is to practice, practice, practice. You might want to try some Alumilite or PR blanks to see how you fair with those--if you're just starting to turn plastics and you've chosen IA, good luck! PS It's not cheating to use the 400 grit "skew" to finish turning an IA blank once you're close to final diameter. Unless you are POSITIVE the tube won't show through, ALWAYS paint the inside of the hole. Oh, that is nice! Since the tube needs to be roughed up, I wondered how to prevent that from roughing up the view through the acrylic. This suggestion is money. Now, how do you paint the inside of the tube? What type of paint? Do you use q-tips, or a paint brush, or spray paint? I am very new to this process but have turned about 5 acrylic blanks this past week. On the lighter colored ones I used a white spray paint primer. I used a dowel or a board with some screws sticking out to paint the tubes. For the blank I just sprayed down the hole. For the darker blanks I used flat black spray paint I had on the shelf. I use Testers model paint applied to the inside of the hole drilled in the blank using a q-tip. I wait a day for the paint to dry then I glue in the brass tube. 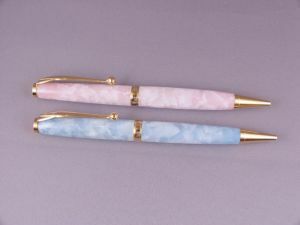 Michael; Check out this article on pen blank preparation. Note the section on how to drill and cut acrylic blanks. When the drill bit breaks out of the bottom of the blank, it often leaves stress cracks behind. Acrylic blanks should always be painted on the inside of the drilled hole. I use a rattle spray can. Just two Fssst down each end of the tube and let dry overnight. You can change the look of the blank with different colors. 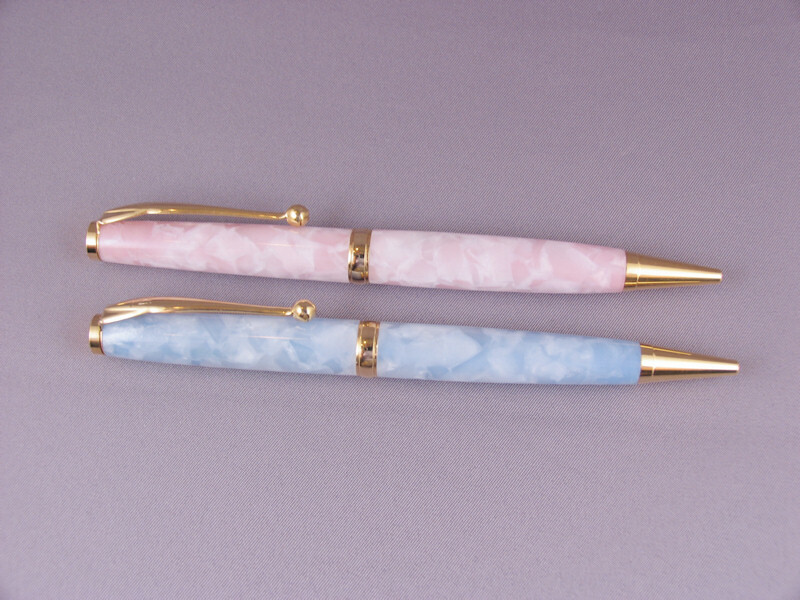 These two pens are the same blank, just one is painted with baby blue paint, the other with hot pink. Pits can be filled with Medium CA. Do Not sand the blank prior to filling the pit or sanding dust will leave a white spot on the blank. Personally, I do as one of the above posts describes for most of my plastic blanks--spray the hole with grey primer. I've used white, black, and other colored spray paint as well if I want to manipulate the color of the plastic. Grey primer seems to be fairly neutral, and dries quickly; still, I like to let it dry at least 24 hours. I used to paint both the hole and the tube, which also works but I no longer think it's necessary. If the tube is tight, doing this can also make it too tight. If you bought a new negative rake carbide tipped tool & used it for turning acrylics (aka plastics) you'll never regret it. And you can say good bye to any problems turning plastics again. I add an additional step when painting that has helped. After spraying from both ends I mount the blank in my chuck and spin at max rpm. It leaves a smooth even coat of paint in the hole. I also learned to let it dry a day before glueing in the tube. For gluing the tube, I add glue to the hole on one end of the blank so it covers about half the hole. I then plug the tube with modeling clay. Coat 2/3 the tube with glue and insert it into the other end of the blank. That way as the tube goes into the blank and the glue from the end get scraped off along the way in, it meets up with the glue already in the blank. I’ve not had a tearout since doing this.